Power Pivot in SharePoint used to load a gallery the workbooks and shows a screenshot of each report. However, sometimes you open the browser, navigate to the page and find that it’s not loading with a "Install Microsoft Silverlight" message. Even after installing Silverlight, it still says the same thing. Chances are you you are using Google Chrome. That is the crux of the issue. 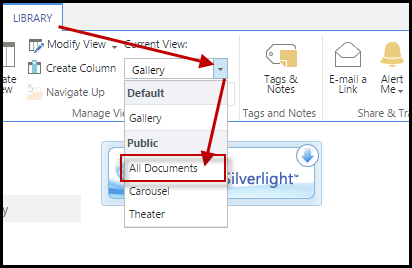 Google decided that Chrome will no long support many different types of plug ins, in an effort to conform with web standards, so they no longer support PowerPivot Gallery in SharePoint which depends on Silverlight. The Solution is to use Internet Explorer. Use Power Pivot without the gallery. The gallery was just a nice presentation of displaying snapshot of the reports, but are not necessary at all for rendering Power Pivot workbooks. 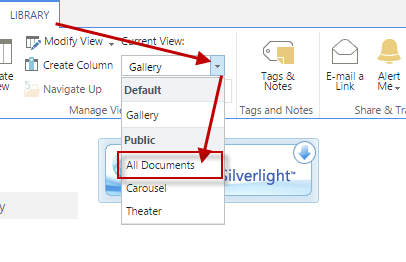 In fact if you have files in the gallery, you can change the view in SharePoint on the list and you can see your files (or even upload new files). If you decide to go with Option 2, you may want to make that your default view to completely abandon the "silverlight" message. To set as your default view. 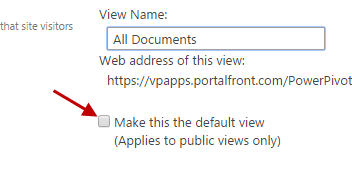 Select the view you want to make the default. 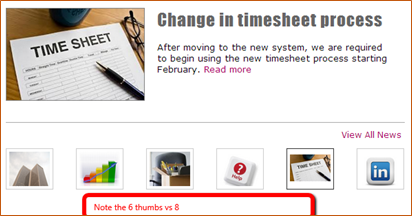 Check "Make this the default view"
By Doing this moving forward you will see a list of your workbooks by default. Clicking on a workbook will open it in the browser and you will continue to be able to view and interact with your Power Pivot Report.